This intently gripping and expertly penned work of eighteenth-century murder mystery is set in the swirling mists and fogs of Thameside London. A city growing very quickly and becoming extremely rich. However, much of the wealth is coming from the colonies and much of that based upon the slave trade. Our man is Captain Harry Corsham, a veteran of the American War of Independence and now due to an injury to his leg is attached to the War Office. The war is still raging in America with the thirteen colonies supported by France declaring independence from the British Empire. Britain is faced with two enemies, one close at hand in France and the other thousands of miles away in North America. The strain on the Empire is great and the Government has enough to contend with without trouble over the slave trade. Corsham is approached by Amelia Bradstreet, the sister of an of old Oxford friend who asks him to inquire into the whereabouts of her brother - Thaddeus Archer, known as Tad, a lawyer who opposed the slave trade and actively worked to end the dreadful business. His actions had brought him enemies within both the slave traders, and the country's elite who profited from the trading in slaves and other cargoes from the colonies. Tad’s mutilated body is found in the docks at Deptford. In trying to find his murderer Corsham goes against his superiors and becomes embroiled in the savage world of the slavers, soon finding himself a target. Corsham’s problems originate within Deptford, but soon his troubles take him into London, where powerful figures want his investigations stopped. The questions of what occurred aboard the slave ship The Dark Angel which Tad was so interested in, and what have the owners to hide, become anchors that pins this narrative. When Amelia is murdered too, Corsham is soon arrested and charged with her murder. Harry will need all his skills as a soldier to survive and his quick brain as a War Office official, to weave his way through the political connections of colony investors, government officials and slave traders. All the while still concentrating on his goal of bringing Tad’s murderer to justice. Corsham is faced with a defining decision to make. Does he go on trying to get justice for his friend's death and be ruined by the powerful men who defend the Government and Establishment? Or does he turn a blind eye, deny his friendship and live a lie for the rest of his life? 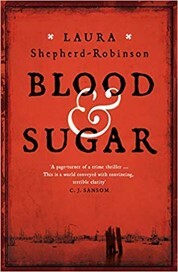 Laura Shepherd-Robinson has created a scintillating piece of writing setting her hero a series of challenges, while surrounding him with moral dilemmas, while building a mesmerising plot full of period detail.